Shariff Kenny and Marc Bruce were too much to handle as the Blue Team defeated the Orange Squad in the 6th Grade game of the 4th Annual J.E.M. All Star Classic. Justin Moore had an excellent showing for the Orange squad. Shariff Kenny (District Heights, MD)- Kenny dominance was known before the start of the game that’s why he was switched to the Blue team. Once the contest started he took over the point guard duties and stole the show. His court vision and willingness to pass stood out and had the crowd in frenzy. He totally dominated the game without taking a shot. If he decides to play on this level full time I could be curtains for a lot of teams. Marc Bruce (Bayonne, NJ)- Bruce also had an argument for MVP honors. He shot lights out from the perimeter while also scoring inside. He came out playing with high intensity and never let up. I saw him play several times and this had to be his best showing. He had everything flowing. Justin Moore (Accokeek, MD)- This also was my first time watching Justin play with his grade level and I must say that he should be considered one of the top guards in the country. He made things look so easy and he seemed to see the game at a different speed than his counterparts. He gets anywhere he wants on the floor and can find his shot with ease. His flow was so natural and his instincts are very advanced. Shamar Florence (Burlington, NJ)- Florence was a pleasant surprised because I thought he was just a post up player. I actually like the way he handles the rock and scores when attacking the basket. He shows good strides in transition and I like the upside he possesses. I have a new respect for his game. Cole Antony (New York, NY)- Anthony started off a cold but eventually found his scoring rhythm. His ability to move without the ball helped him find his groove. You can see some of the special qualities he possesses as soon as he touches the rock. Dajuan Piper (New York, NY)- Piper used his attacking style and defense to make an impact on the game. He’s tremendous in transition when using his body control to finish off plays. He’s a throwback NY guard for real. 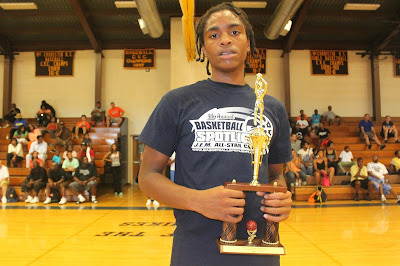 Josh Pierre Louis (Plainfield, NJ)- The “Jet” was all over the floor. He carved his way through the defense and made some impressive plays. He also got busy on the defensive end of the floor. His ball pressure caused a few turnovers and he was a demon in the passing lanes. Terrence Williams (Clinton, MD)- Williams had his moments. He has a feathery touch and some good footwork for the player this young. He also isn’t afraid to hit the glass for rebounds and play a little defense. Trevon Alderman (Wilmington, DE)- I almost forgot about this youngster but he turned up is play in the second half. The explosive guard finished at the tin through contact and can be considered a natural scorer. We expect him to really take off next season.